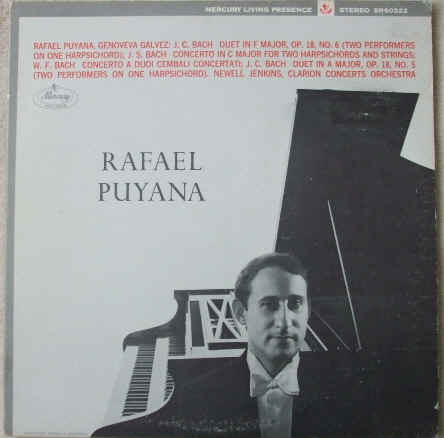 33rpm LP Record of SR90322 RAFAEL PUYANA PLAYS BACH, featuring Rafael Puyana and Genoveva Galvez on harpsichord playing works by JS Bach, WF Bach and JC Bach. Also featuring Newell Jenkins conducting the Clarion Concerts Orchestra. It was issued on the Mercury Stereo Living Presence maroon label. USA pressing. The record itself is graded a bit less than excellent, with a number of light surface marks when viewed under normal house lighting. These do not adversely affect playback in any way. Superb sound quality, with NO jumps, ticks, pops or crackle. Lovely crisp, clear, faultless playback. Light spindle wear. Labels very clean. Light spider marks. The outer sleeve is graded very good with some rubbing to edges, bumping to corners, light ring wear to front cover, light sticker removal residue also to front cover. The original inner sleeve is graded a bit less than very good, with a couple of splits and thumbnail tears but nothing really drastic.